The Elvex 90 Series ProChaps is our best-selling chap model because of the patented asymmetric design. 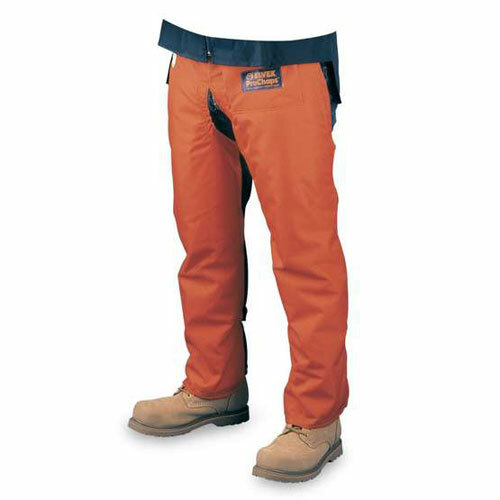 Elvex chainsaw chaps meet the requirements of ASTM Standard for Leg Protection for Chain Saw Users (F-1897-2008). This standard requires that the chaps can stop a chain saw running at 2,750 feet/minute tested at both 45º and 90º to the longitudinal axis of the test sample, under controlled laboratory conditions. Prolar technology combines a unique fiber composition with special, multi-layer weaving process to create one of the most effective chain saw protective pads on the market. Prolar works due to its secret and unique "explosive" action which effectively jams the chain against the bar and the sprocket--quickly and safely stopping the cutting action in milliseconds.